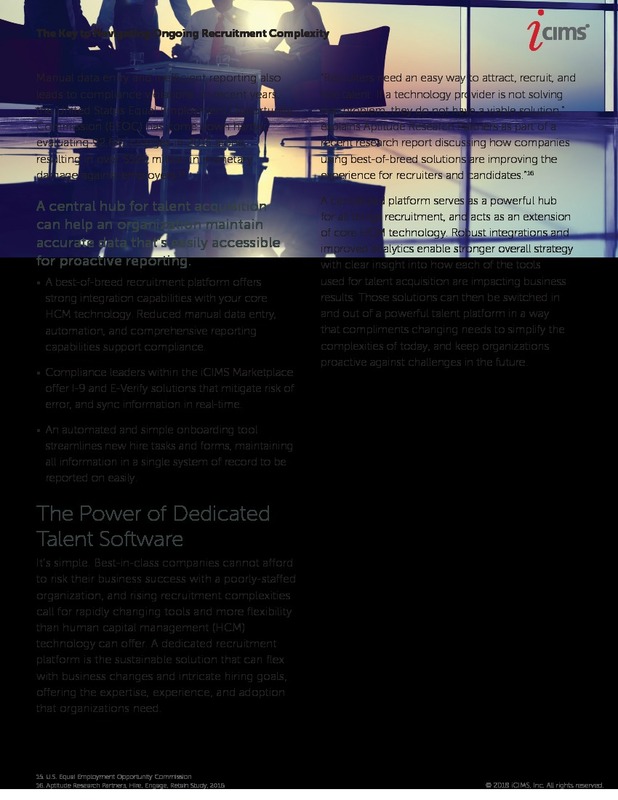 Competitive organizations are recognizing that talent acquisition is complex and changes often. To reduce those complexities, they are trusting dedicated, best-of-breed talent solutions to drive recruitment activities that fuel business objectives. A best-of-breed talent platform offers a simple experience with turnkey integrations to unite all of the tools used for HR within a single location. This allows employers to centrally manage all solutions with a unified view into data and analytics that impact return on investment. 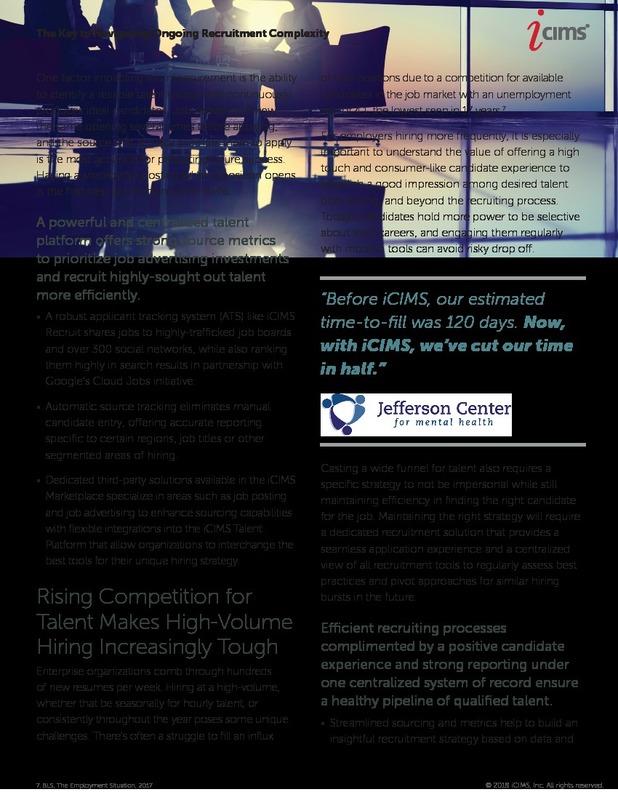 Without this type of solution giving recruitment the focus it requires, processes can be slowed down, impacting the ability to recruit the right talent and having a negative effect on business results. 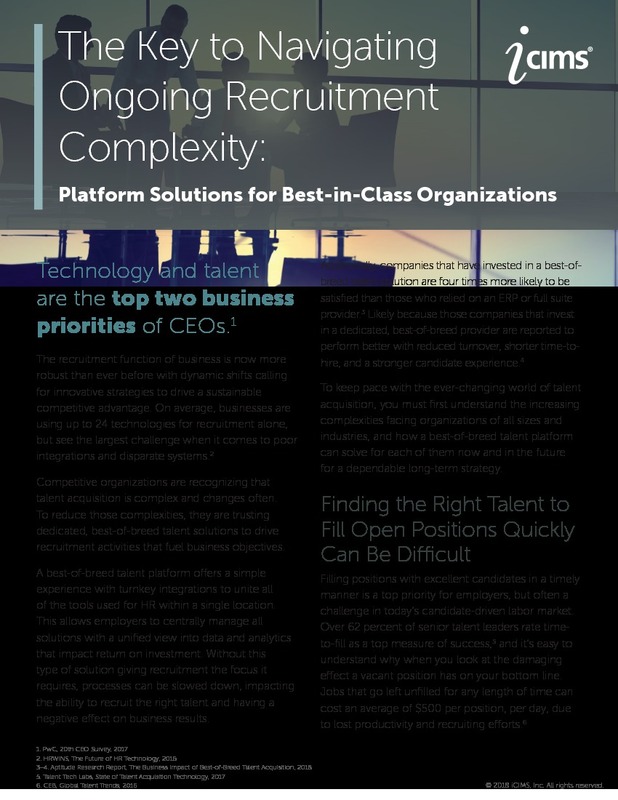 To keep pace with the ever-changing world of talent acquisition, you must first understand the increasing complexities facing organizations of all sizes and industries, and how a best-of-breed talent platform can solve for each of them now and in the future for a dependable long-term strategy. One factor impacting this measurement is the ability to identify a reliable talent source that continuously produces ideal candidates. Job seekers will view the same opening several times before applying, and the source that actually prompts them to apply is the most accurate for predicting future success. Having a strategy for posting when a position opens is the first step to improving time-to-fill. A powerful and centralized talent platform offers strong source metrics to prioritize job advertising investments and recruit highly-sought out talent more efficiently. A robust applicant tracking system (ATS) like iCIMS Recruit shares jobs to highly-trafficked job boards and over 300 social networks, while also ranking them highly in search results in partnership with Google’s Cloud Jobs initiative. 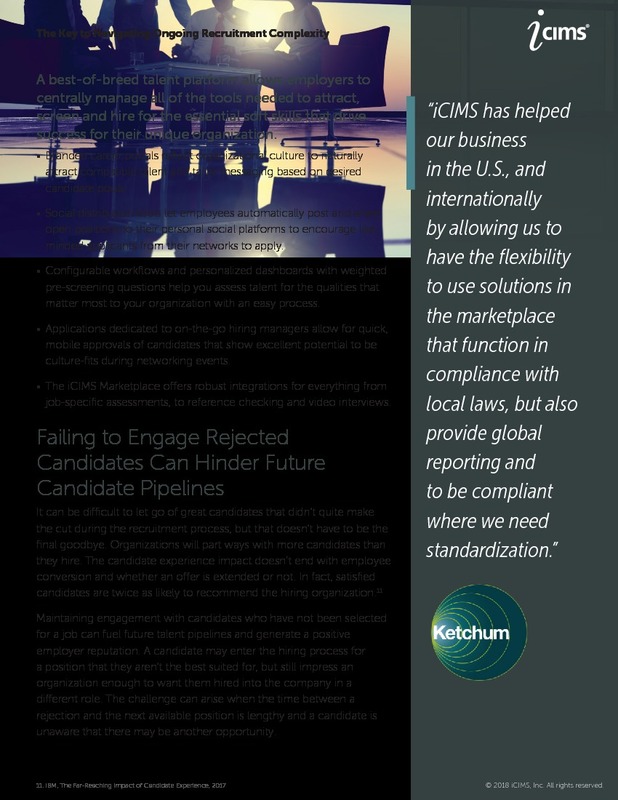 Automatic source tracking eliminates manual candidate entry, offering accurate reporting specific to certain regions, job titles or other segmented areas of hiring. 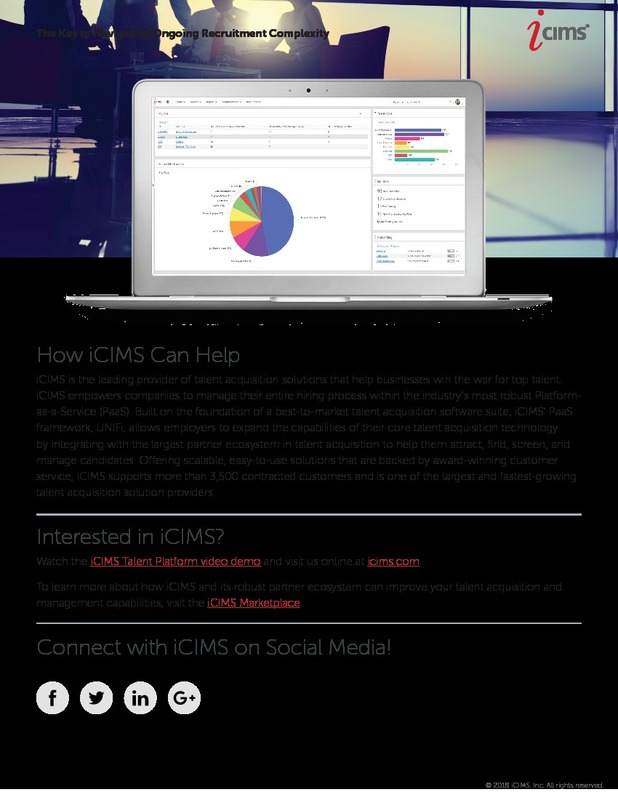 Dedicated third-party solutions available in the iCIMS Marketplace specialize in areas such as job posting and job advertising to enhance sourcing capabilities with flexible integrations into the iCIMS Talent Platform that allow organizations to interchange the best tools for their unique hiring strategy. For employers hiring more frequently, it is especially important to understand the value of offering a high touch and consumer-like candidate experience to establish a good impression among desired talent both during, and beyond the recruiting process. Today’s candidates hold more power to be selective about their careers, and engaging them regularly with modern tools can avoid risky drop off.